What is another word for indicates? Indicated, cites, hints, says, conclusions, data, Recalls, waves, meets, indication, indica. 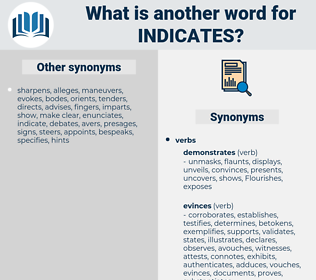 indications, specifics, notes, directives, references, documents, signs, tells, stresses, directions, Records, sets, yields, pinpoints, expresses, accounts, flags, designates, LINEs, Recalls, signifies, lists, establishes. suggested, revealed, noted, reflected, signified, implied, conveyed, signalled, Assessed, pointed, Meant, said, stated, listed. 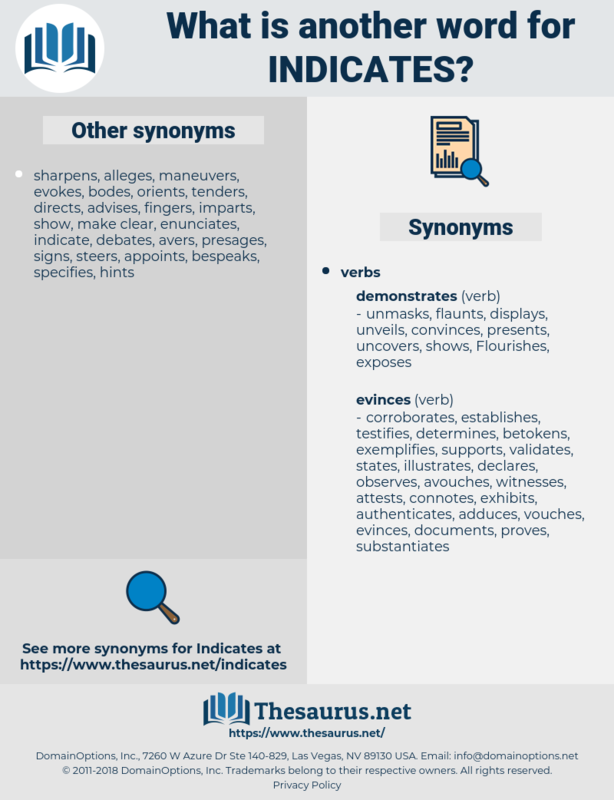 demonstrating, designate, delineates, illustrates, substantiates, anticipates, dictates, insinuates, reiterates, attest, attests, characterizes, descriptions, correlates, connotes, calculates, mentions, estimates, includes, validates, describes, contends, communicates, infers, characterises, contemplates, intends, confirms, constitutes, appreciates, depicts, explains, translates, relates, articulates, Indices, acknowledges, introduces, note, Specifying, testifies, cautions, in, informs, enumerates, distinguishes, equates, detects, predicts, invites, indications, creates, certify, certifies, reminds, celebrates, emphasises, advertises, exists, contributes, alludes, description, coincides, Outlining, outlines, declares, intimates, implementation, implies, portends, entails, Manifests, detail, clarified, clarify, clarifying, mandates, conveys, involves, traces, emphasizes, directs, transpires, constituents, concludes, discloses, Guarantees, reaffirms, assigns, recognises, advises, verification, underline, underlines, considers, appears, percentage, reference, insists, invokes, recommends, sustains, narratives, writes, discover, discovers, proves, underscores, annotations, directory, Into, seems, announces, consists, recognizes, Stating, understands, renders, alleges, warns, announcement, summarizes, quotes, alerts, derives, responds, depends, encompasses, nevertheless, demotes, regulates, symbolizes, teaches, exemplifies, affirms, examines, adds, assesses, highlight, highlights, expects, brandishes, benefits, economic, notifies, decides, verifies, analytical, reinforces, maintains, forecasts, comments, opens, Addresses, decals, demands, regards, commends, proclaims, collects, prescribes, comprises, components, belongs, needs, summarises, compares, enables, stands, deducts, warrants, assumes, devotes, encourages, confers, reproduces, sends, bearing, Bears, leads, argues, emerges, portrays, selects, concerns, trains, finds, exhibit, exhibits, appoints, foretells, learns, embodies, particulars, claims, captures, promotes, enters, features, betrays, evokes, envisions, heralds, justifies, presents, Deems, switches, uncovers, Tracks, conforms, targets, moves, Permits, rejects, licences, arises, Tests, qualifies, prints, assures, delivers, likely, matches, taps, registers, foresees, audit, feels, showcases, helps, guide, presupposes, refines, stems, believes, requires, submits, dismisses, Grants, elects, lies, unhides, advisable, covers, affords, prohibits, aims, desirable, explores, results, deals, red, lays, pursuant, occurs, marks, Watches, heads, Adopting, reads, showcase, Leaves, analysis, draws, possesses, discusses, turns, agrees, prepares, returns, offers, equals, endorses, thinks, produces, prompts, Gives, decrees, remarks, supports, encounters, casts, exposes, therefore, wears, disposes, follows, upholds, ensures, proposes, status, Analyses, raises, speaks, becomes, observes, fits, calls, envisages, unveils, Has, Comes, applies, serves, builds, rule, asks, plans, Backs, senses, takes, notes, poses, amounts, smacks, member, sounds, seeks, imposes, references, Strikes, wants, allows, VISAS, breaks, owns, acts, case, places, supplies, hears, releases, reviews, Rests, Those, see, sees, frames, falls, crosses, mirrors, keeps, holds, Copies, pays, to, remembers, wishes, puts, documents, light, posts, Focuses, signs, requests, shares, tells, stresses, lets, talks, figures, Which, goes, flows, Records, sets, sheds, looks, yields, numbers, pinpoints, expresses, Does, here, 's, makes, accounts, signify, cites, outline, hints, says, stipulate, designates, Recalls, signifies, meets, lists, establishes. reveal, signify, outline, stipulate, advise. incorporates, evidence, evidences, nominates, instructs, asserts, labels. First seed to fall indicates that the person for whom seed is named is not a true lover. I suppose that indicates earlier advancement in compassion.